Signed and personalized copies of Bottomland and The Quickening available through the Harvard Bookstore, shipped to wherever you might live. Go to http://shop.harvard.com/michelle-hoover-signed-copies to order your copy. Write your directions for personalization in the comments section. 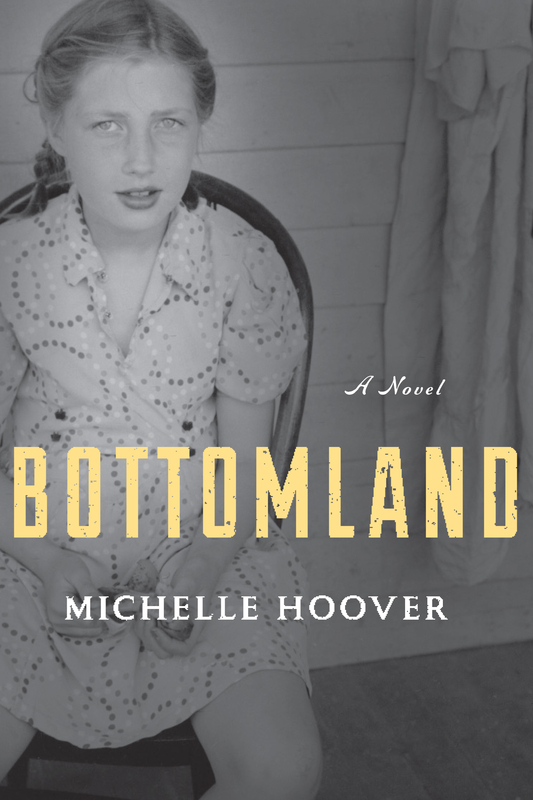 t once intimate and sweeping, Bottomland—the anticipated second novel from Michelle Hoover—follows the Hess family in the years after World War I as they attempt to rid themselves of the Anti-German sentiment that left a stain on their name. But when the youngest two daughters vanish in the middle of the night, the family must piece together what happened while struggling to maintain their life on the unforgiving Iowa plains. Shortly after the publication of The Quickening, I was visiting family in California when my father’s cousin took a single glance at me and said: “You look just like one of your great aunts.” The remark, for some reason, saddened her. Later, when I asked my Aunt Irene who she meant, my aunt pulled out a photo album and told me the story: two of my great aunts, my grandmother’s youngest sisters, were rumored to have disappeared. She showed me the family photograph. There they were, two girls in the front row, the first on the left looking every bit as mischievous as I would expect of a runaway. 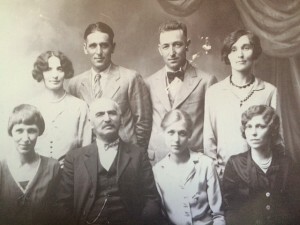 But the youngest girl, the one sitting on the far side of my great-grandfather, looked shy, subservient. But it was the youngest, my aunt explained, who did not come back. I was immediately hooked: what could make such a young girl, such a timid and seemingly dependent girl, choose to leave her family forever? And what could make her sister, the one with the feisty glint in her eye, choose instead to return home? In the photograph, my grandmother, named Nan in the novel, stands at top right. Next to her is her brother Lee, then Ray (not his real name), and their sister Agnes. My great-grandfather, Jon Julius, or JJ, sits between the two girls, known in the family as “the little girls.” At the end is another sister, who I chose not to include in the novel for the novel’s sake. There were just too many sisters. I had long known that we had the surname “Hess” in our family, and when I was younger I was embarrassed by this connection to what seemed a terrible lineage. I wanted to understand that embarrassment, that idea of self-hatred that many immigrants who come from supposed “enemy” countries, are taught. This historical connection to the girls’ disappearance seemed dramatically right. Otherwise, the personalities in the photograph “jumped off the page.” I knew these people, though I know that my understanding of them is likely very different from who they actually were. My “Lee” in the novel is warped by the fact that my own late father was also named Lee, and so the character became a lovable if broken man in the book. The character of Ray was sharpened by his dark, handsome looks—I am told he was nothing like the character in real life. The character of JJ was influenced by my ideas of early German immigrants—proud, hungry, gruff. He is large in the photograph, as he is in the book. My portrait of my grandmother is likely similar to who she actually was—intelligent, efficient, loving, but behind a bit of a wall. Each of the characters yearns for something they can’t quite have, and the yearning itself threatens to pull the family apart. Of course the girls are there, right in the picture—Esther with that wicked smile of hers and Myrle so meek, so pale. What happened to them? It took a few years to puzzle it out. And even if the story isn’t the same as real life, I believe I found something that is true in many ways to those who yearn for both family and self, those who are just like us. t was little more than a month before winter shut us in when I last saw the youngest of my sisters. Our little Myrle. I woke to find her shivering just inside the front door when she should have long gone to bed. It was dark as a cellar in that hall and outside it would be darker—miles of field and grassland lay be- yond the front porch. Our house sat alone on the prairie, far from its neighbors. The road to our place was a run of stubble and dirt. Myrle’s hair shone white on her shoulders and she wore nothing but a nightgown, her arms and feet bare in the cold—not enough sense to cover herself though she was almost grown. The look she gave, as if startled out of sleep. Her eyes teared and she ducked her head. The door was locked at her back. Af- ter the war, Father would have made sure of it. A draft rushed our ankles from the doorstep. The rest of the house was still, nothing but a wind outside knocking the stable gate. I touched Myrle’s forehead and felt it damp. She brushed away my hand. Her other hand she hid behind her hip, and when I asked her to show it, she glanced up the staircase and called our sister’s name, as if Esther might rush down to save her. I turned my head and Myrle was off—the white of her nightgown a whirl up the stair.